Salad can be boring. Let’s be real. How many people really ‘crave’ salad. 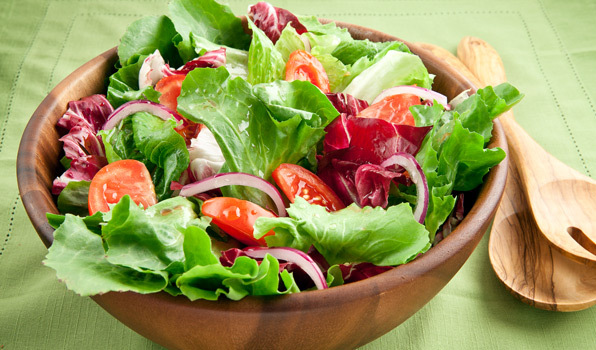 Few yes; but the benefits of salad to your daily food intake is so important. Greens fuel your body, help your skin, weight control, are packed with dense nutrition, and can keep you regular to name a few benefits. So often people think of salad and say blehhh and then think of the prep that goes along with it and there goes that side dish. One of the best things I have done is keep prepping to a minimum. I make just enough for dinner and one serving left over for lunch the next day. If I skip the salad during lunch I add the leftovers to my next nights prep and it takes me 5 minutes to whip up a salad. I also find that when you incorporate salad into your day and fill your plate with 3/4 salad you tend to indulge less on the bad stuff and snack less later on throughout the day or night. 1. Add some protein – Chicken, Steak, Hard-boiled egg, Fish, cheese, and nuts which can be heart-healthy fats, protein, and have disease-fighting vitamins and minerals. Keep your portions to 4-6 oz of protein for meats and fish, 1-2 hard boiled eggs. no more than 1/4 cup of low fat cheese, and just a handful of nuts. This will keep that salad healthy and low calorie. If you add all of the above cut the portions in half, however, I recommend choosing just 2-3 of the above so as to not take away from the overall goal of enjoying a healthy, lower calorie, salad. We are trying to enhance the salad not over run it with additives. 2. Healthy Fats – Such as nuts again; remember that handful is plenty and some good ones to try in your salad are cashews and macadamia nuts. 1/4 of an avocado, 10 olives, and a tablespoon of olive oil, peanut oil, or sunflower oil. So why are healthy fats important anyways? Well using monounsaturated fats, aid nutrient absorption. This means adding these healthy fats to your salad will maximize your vitamin absorption. 3. Veggies! Veggies! More Veggies please! Asparagus, Green beans, Spinach, Broccoli, carrots, onions, tomato (o.k. technically a fruit I know!). Get happy there really isn’t such a thing as too many veggies in my opinion. The more the merrier so make yourself vegetable happy! 4. Sweeten it up with some fruit. Adding fruit to a salad can make your lunch or dinner taste like a sweet treat. Try adding strawberries, mandarin oranges, grapes, mango, or apple. Some great cheeses to compliment fruit in a green salad are gorgonzola, feta, and goat cheeses. 5. Lastly, what is a salad without salad dressing?! Keep it to 2 Tablespoons max and try to stick with oil and vinegar based vinaigrette dressings. I recommend finding some quick and easy homemade dressings you can make yourself. My favorites are the Beach Body 21 Day Fix Balsamic Vinaigrette and Dijon Vinaigrette recipes. Most store bought dressings are loaded with unknown ingredients and sugars. I know the creamy dressings like ranch and blue cheese are tempting and every once in a while go for it but if you want to keep it light, healthy, and delicious you cannot go wrong with a tasty vinaigrette. 6. Yes I know I said five but as I was typing I remembered another great way to spice it up in the salad department. Herbs! Basil, Cilantro, even ground cinnamon can put a new twist on your plate of greens! So there you have it; my favorite 6 ways to keep salad exciting, versatile, and a staple at your dinner table (breakfast and lunch are acceptable too :)).